This rainbow bowl is made from hand pulled cane. Making a cane bowl is a time consuming two-stage process. First Dirwood hand pulled the rainbow canes used to make this bowl, then he made the bowl using those canes. 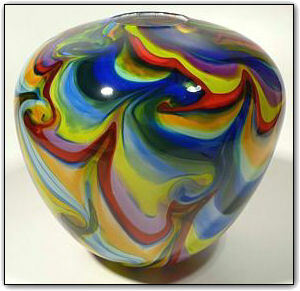 To help the colors stand out and to make them even more deep and intense, a technique was used to add a very thin layer of white beneath the colors, making the colors just about jump out of the glass. The colors are so deep, rich, vivid, and amazing!